As you get more experience and improve, so should your techniques adapt to deal with the developing attackers; better yourself by working on your overall game. And with that being the same case for anyone that comes after you, you’ll always have someone nipping at your heels trying to take that very same spot you had to compete for in the first place. But that should be motivation to keep onto it and beat them out from overcoming you and your spot, not to slip into lack of effort because you get down about things! Are you prepared to go the distance and go that extra mile, and always be giving all you’ve got no matter what? It’s no easy task, but someone’s got to do it; well, you’ve got to, if you want to get there! Life isn’t (always) a bed of roses, if it is, you can’t see the thorns (well, that’s not to say life isn’t enjoyable or isn’t a gift, that’s just admitting that sometimes it will be hard and hard work!). And, if you don’t have to work hard for something, especially in sport, you’re not going to be pushed to play your absolute best because you’ll always be at cruising speed (or level!). So, in a way, it’s important you have competition and really fight for your chances. Not all goalkeepers wear the number 1 shirt, but still stake their claim on the starting position for their team or nation nonetheless. How hard you apply yourself to something (whatever that may be, in life) has a big impact on things and the way people see you. Take training sessions: are you prepared to put in, even if you don’t much out of it as a goalkeeper; focusing on the basics like stance, angles and attacking shots? You get out what you put in, as they, in any aspect of life! A lot of people (maybe it’s just youngsters with the wrong attitude, or an assumption that talent means you don’t have to work that hard! ), seem to think you will get by on natural talent without the need to work hard at things. Let’s just think about it for a moment. A goalkeeper with not all of the attributes of an elite goalkeeper can outdo one that does, purely based on work ethic, constantly pushing themselves to improve, and hard work. Essentially, because they are working hard, they should perform better (something I’ll try and cover more in depth later). Compare this to a naturally talented goalkeeper who is capable of really dominating, but not doing so, because they aren’t pushing themselves, in comparison to the goalkeeper edging them out because they are! Talent doesn’t necessarily give you a one way ticket (not sure that’s the best phrase) to success. Similarly pure athleticism which hasn’t been harnessed or concreted through technical understanding (take Tim Howard in his early days) can see a goalkeeper still making the saves and getting the job done, even if it isn’t always pretty! But, coaching is helpful for refining and harnessing these attributes, so seeking out coaching help or going to summer camps should help you learn to improve and make these habits routine in the regular season. Either way, you still have to work for it! First, you need the talent, and then you need to push yourself as much as possible to keep developing and evolving up the scale of elite standard goalkeeper. You have to work hard and you have to earn it! It doesn’t come for free! You don’t just rock up to a goalkeeper genie and say hi, I’d like to make my wish of being the world’s best hockey goalkeeper a reality. A dream come true. Humour aside, it’s a big effort and you need to graft and put in the hours to out graft and then outshine people who want that elite level starting spot just as much as you do (maybe they want it more, even!). Some people dream and some people go out and make those dreams real!! Also dieting (eating well, not slimming down! ), not wasting time on things that could get in the way of sporting commitments outside of hockey, in order to be in optimum shape for games, is important. Also, staying in good athletic shape is important because you are retaining fitness levels and staying sharp. There is only one starting spot, it’s not like you’re a rolling sub for an outfield position. With one spot, you have to fight for it unlike anything else another player might have to go through in a club or team! And with the 1stXI spot, this is even more so. Sometimes, the only way in is to force yourself into the position and beat the other goalkeeper out of theirs. They may see it as a reason to ‘up’ own game, or even unfair (as they worked hard to get way they are; especially unfair if you do take hold of the spot), but you have a challenge on your hands regardless! Your attitude is everything, especially if you want to be the first choice, of a national league level club, for example! And even if you do manage to wrestle the starting spot off a team mate, the coach still has the right/chance to yank you out of a game or switch things up and drop you (back down the pile). Take Szcesny and Fabianski (who is the one actually getting the starts right now, in spite of the doubters, whilst Maonnone deputised for a string of games) at Arsenal. If you have been the only goalkeeper around in teams/club as a youngster developing, then you may not be used to a stringent level of competition and get used to not fighting for your place. But once you climb the ladder and get to the highest rungs, you will soon realise how much of a fight you will have for the starting spot, or spots at the top levels within your club! Once you get to the elite tiers, you really are fighting for your spot. If you have the wrong attitude and don’t want to fight for it, then you’re not going to get anyway or develop as a goalkeeper with the right skill set and right mind set! Once in the elite level, you’ll quickly realise how much you have to want that opportunity to get where you want! Otherwise you will be outworked, outrun, outgunned (in terms of save making!) even and perhaps go back down the ladder because a situation has arisen that will change circumstances for you, such as another goalkeeper joining the club who has played at a higher level previously or has more experience than you do, thus affecting your positioning in the club tiers and chance for high level games. Without going back and saying exactly what I said, through rephrasing or just rewriting it (and rewriting the “fighter” article from a while ago), I want to allude to how good you are versus how good people think you are or rate you as. What you don’t want to do is end up “blowing your own trumpet” and thinking you’re the best around when you still haven’t proven that’s the case. And getting overly confident and full of yourself to the point it’s damaging to your game because you don’t bring your ‘A game’ because you don’t think you will have to work and be tested (not the same as being confident constructively and having buckets of self belief!). It’s easy to play well for a few games (versus a season), and end up “over rated” simply because you have played some ‘blinders’, but if you can’t play to this level consistently, that is the difference maker. In the sense that if you ended up hitting a bad patch and unable to bounce back, you may not be playing as you will get dropped for another goalkeeper that may be able to consistently play well versus ‘streaky’ wins and losses, because you’re not used to fighting for a win, or struggle to bounce back after a bad game. This may sound odd considering what I’ve discussed when needing to be ‘cocky’ and confident. But it is still important to remember yourself and your role within the team as a goalkeeper. The goalkeeper carries their team, not the other way round, but that doesn’t mean they should get too ‘big for their boots’! The “egoless approach”, which is something ice hockey goalie analyst Justin Goldman has written about, is important very much so and equates to getting on with playing well and showing how good you are without needing commendations lauded on you. Actions speak louder than words! So show how good you are without saying so!! Something I might have missed in the ‘cocky’ goalkeeper article, but . A selfish attitude doesn’t get you far and will annoy team mates. Also blaming others if . Team mates prefer it if you are open and take responsibility on board (takes the blame off their shoulders!) and . Another important thing when it comes down pushing for the first team place, is how you need to be constantly evolving versus staying as is and getting complacent, which you can read about in the write-up I did previously. Joe Hart will always say that he’s “always looking to improve”. He is never stopping in the way he wants to push himself and reach new heights and always get better. Rather than being happy with how things are. So, he might not be at the top of his game right now (neither is Reina), but his attitude speaks for itself. He is always looking to get better. He is not sitting around and saying ‘I’m so great, look at me, blah blah blah’ or listening to people saying he’s the, or one of, the world’s best, he’s going out there and working hard to make it happen. Versus not and being complacent, lazy and expecting such comments to just be given to you! Don’t be lazy, be like Hart, have the heart to improve!! Being analytical of your own game means being able to analyse your weakness and look to improve them, and even to work on refining your strengths. To step outside of yourself and critically consider how well you play. To be able to identify key areas and look to improve them. You can’t improve if you don’t think you don’t have anything to work on! You can’t reach perfection if you think you’re perfect already. When you’re not! At first you may not feel comfortable to think about yourself in this way, but you need to be assured and confident enough to do so. By looking at yourself in the mirror and considering how well you play or are playing during a season, you can improve greatly as you pinpoint things that need working on. It’s not a case of being your own worst enemy, but a cool headed analytical means. This is case of personal reflection, a desire to improve and be the best player (and goalkeeper!) you can be. A positive rather than negative attitude or viewpoint. Sometimes, the only person who can analyse your performances (other than a coach or team mate or fellow goalkeeper at your club even), is yourself, especially if you don’t have a goalkeeping coach to work with. So you need to be able to do so and improve your game and your level of analysis as you do so. Ultimately, not everyone wants to be the best in the world or the best at their club, just the best player (goalkeeper!) they can be. There’s nothing wrong with that, at all, in fact, it’s better to want to be the best at everything you can be rather than for anything else. If you are talented inherently, then pushing yourself to be the best you can is going to be make you one of the best around! Even if you don’t think you can, you can still have the same mindset of that of an elite goalkeeper. Like people say and I stated, it’s your work ethic and if you work hard, then coaches will notice it and you may also outwork other goalkeepers and rise up the ranks. Want to be the first option for team selection, want to outdo everyone else and want to make that spot yours and no-one else’s! Don’t just be happy with second best. A goalkeeper who expects to win games or train or play well, without putting in the effort is not getting to get too far! So, work hard, analyse, look to improve, and you should make the number one spot yours (eventually?!)!! In order to provide consistent performances for your team, you need to be proficient college paper writing service in your technique. That is to say you need a strong technique to base your save making from. For example, if you have weak positioning, then being caught out of position, shots are more likely to sneak by you, or you will have to dive or desperately over extend at every given opportunity. If you have a poor imbalanced ready stance, then it will be difficult to control rebounds on the save or will end up on your backside flailing around against a secondary shot! The more you work on improving technique and developed a strong core foundation to make saves from, the better your match performances will be. The key to strong performances as a goalkeeper, other than a confident mindset, is obviously down to technique. The stronger your technique, the better placed you are to make first and then secondary saves, to break down scoring attacks through rebound control and aggressive interceptions and so on. But your application of technique filters down to a strong foundation, which is a good ready stance, positioning and understanding of angles. The better your foundational technique, the better equipped you are to stop everything that comes your way. You don’t build a house on sand, unless you want it to slip away! Like the metaphor, you need to work on having solid foundations so you don’t have a poor season (one excellent game does not a good goalkeeper make!). Of course, unless you have the privilege of having a goalkeeper specific coach to work with, or the help of a more experienced goalkeeper (who actually knows what they’re talking about! ), it’s going to be difficult to work on improving your technique. However, there are some things you can work on without a coach, like positioning and your ready stance, making a self enforced effort to practise it in training. There are also useful guides like Kathleen Partridge’s goalkeeping manual (http://www.kathleenpartridge.com/book.aspx) or you can learn something watching high level games in person or on sites like youtube. If you have the ambition and desire to play at the highest levels, then you need to be able to filter out poor technique and work to develop solid save technique. In order to play to the highest level, you need to have well defined basic technique. If you don’t and you get the chance to play at a higher level, then this will quickly be exposed and you will be torn to shreds! For example, poor rebound control, by not turning the shot away, can lead to another unnecessarily allowed shot on goal by redirecting it to a free attacker. Scrambling around unnecessarily, or ending up on your backside from a save are sure signs of poor positioning and poor balance. As much as those laudable amazing saves are fun to do, you need to . Aside from obvious weaknesses in technique, there is also the danger of being too or over athletic. That’s not to say you won’t be required to pull off those spectacular, mind boggling saves every so often to keep your team in it! Of course as goalkeepers we need to be very agile and athletic, but being so when it is not necessary is not needed. Rather, I’ve heard stories of goalies that changed the way they played to try and get noticed when looking to play national league, making those dramatic saves to try and get the attention of the coaching staff. By changing the way they played and looking to make the amazing saves rather than focusing on basic technique, they hampered their ability to perform consistently well. Of course unfortunately some coaches are privy to selecting such a goalkeeper but it is better to be known for providing a strong, consistent performance with no mistakes. Think of Gomes at Tottenham; do you want to be known for your awe inspiring saves and then inability to make the basic ones or string of mistakes? Playing at the top level is obviously a mix of the high end and basic saves, but ensuring you don’t make easy mistakes and let easy ones through you is more important than stopping than unstoppable in most cases. A good football (soccer) saying is “take care of the easy saves and the difficult ones will take care of themselves”. Whilst making those amazing saves is great fun, if every save is overdone, such as having to dive around unnecessarily (that is to say diving at every shot because you are not set on angle or out of position) due to being off angle, then you probably need to rethink the way you are playing. That’s not to say these saves aren’t important, but there’s a time and place for them. Those “flashy” looking saves actually come from good initial positioning and then good footwork and agility to get behind the shot and then strong athleticism to reach the ball. In truth, you’re only really going to be diving against short corners, deflections, or a secondary shot where you are at the other side of goal and have to scramble across to block. Once you have got strong technique, the intangibles of reaction speeds, athleticism and mental strength come into play. You can’t really know how you will perform at a higher level, which is why building strong foundations will help your development and enable you to play to the best of your ability. It is the faster speed and better plays that will draw out these qualities (or not as the case may be!). Ultimately, for you to have a strong season in between the sticks, you need to have solid foundations within your technique. It is obviously difficult to work on improving technique without the assistance of a goalkeeper coach, but focusing on the basics like positioning, angles, ready stance, balance and focusing on the ball and reading the play will help lead to greater success. Remember that it is more important to get behind the shot and stop it, than it is to have to dramatically dive in extension to reach the ball even if at times you might have to! Making sure you don’t make regular mistakes and are able to bounce back from them is important for consistently good goalkeeping. Making mistakes as a goalkeeper is quite an important issue to deal with. With the prospect of upsetting your whole team by a bit of mess up can make the experience of playing in goal a whole lot more traumatising. As they say, sport is 10 skill and 90 psychological, so being able to overcome a significant blip in form is incredibly important in providing your team with confidence in your ability and chance to backstop them to victory. How you deal with mistakes and bounce back from them you illustrate how well you handle adversity and compose yourself. Oops! The sight of the repercussions of a goalkeeper ‘fail’. Starting out as a goalkeeper, it can be easier to make mistakes more readily because of inexperience and lack of training and confidence. But as you develop, you want to be providing solid goalkeeping for your team, with them expecting a good, consistent level of goalkeeping where you make the important stops and more importantly don’t give away easy, avoidable goals. As you look to provide consistency within a season to help your team push for a league topping performance, you also need to work on your consistency within games, making sure you don’t slip up and give away a goal because of poor decision making or the ball squeezing through you. Well executed, practically unstoppable goals are forgivable, whereas your team won’t take kindly to a goal effectively caused by you. Allowing shots through you is a good example of a mistake made in field hockey. James Bailey let in such a goal between the legs against the KHC Dragons in the recent Euro Hockey League games and is the kind of example of where you don’t want to be allowing goals through you. Shots wide of you are more forgivable, but through you, which are just as difficult to stop, your team mates don’t want to see, whilst this is down to good footwork and balance. Other mistakes can be caused by wrong decision making; rushing out at the wrong time to tackle or going down too early on a 1-on-1 for example. Coming out for an interception and missing, leaving the post at the right time or messing up a rebound and sending it out to another to attack to drill it home are others. A simple explanation for regular occurrences of mistakes is a lack of mental strength. As soon as you make one big mistake, your whole game can fall apart leaving you wondering why you got out of bed to play the match! A mental collapse in confidence often leads to further goals as you question and doubt your shot stopping abilities and needs to be readdressed, so you need refocus and forget about the goal, moving forward and making sure you do your best not to concede in a similar way. Similarly, over thinking and over analysing can lead to mistakes as you are unsure what to do, like De Gea’s run last season at Manchester United. Instead, going with your goalie heart and reacting to events rather than trying to hard will make up for this. Wrong decision making can equally be caused by lack of understanding of how to deal with a situation, which requires experience and also awareness of what a goalkeeper should do in a certain situation, so asking coaches and team members advice, as well as looking for information on what to do should help you out. Howlers and bloopers: the ones where goalkeepers are humiliated for a pretty awful slip-up, compiled for video and internet viewing; the types of goals that are every goalkeeper’s living nightmare and which cannot be easily erased. Ones like football’s Rob Green letting the ball squeeze through him against USA, a similar gaffe by Scott Carson, Paul Robinson’s miskick and the list goes on! Some goalkeepers, like Manuel Neuer (one of the world’s best right now in soccer) are amazing shot stoppers and make few mistakes, but the ones they do, are pretty catastrophic. I guess in some cases it’s better to make as few as possible, even if they are more worse when they happen! Of course these are football related, and in terms of hockey, there aren’t many I can think of that come to mind, but Max Weinhold’s goals through him at the Olympics stand out the most. But because a goalkeeper makes the occasional ‘blooper’, if they can make the important saves to keep the score close and win the game, does that mean they shouldn’t be playing? ‘Bloopers’ can ruin a career, with people remembering them more than good performances and can be a goalkeeper’s downfall, so it is best to make sure they never happen! Making mistakes as said earlier can often be a mental (psychological) game problem as much as it is a technical one. Not getting too weighed down with the pressures of goalkeeping and learning to play ‘in the zone’ should help, whilst ironing out technical errors through practise and training should translate to performing well during games. Sometimes training well does not translate to good games, but working hard will pay dividends eventually. The need to iron out making mistakes is important for regular success as a goalkeeper. If mistakes are all too common and a regular occurrence, then something needs sorting out! To be considered an elite goalkeeper (at whatever competitive level), you need to give away mistakes which are few and far between because your team relies on you to not give away easy goals that considerably affect their chances of winning. In football, they call it being a ‘safe pair of hands’ i.e. you’re not going to cause a calamity when you go out to catch a cross or a save, safely collecting or catching the ball instead. You may be able to make outstanding, spectacular saves to deny the opposition, but it is also the goalkeeper’s job to not mess up and give away a terribly easily ‘giveaway’ to the opposition. Gomes in his early days at Tottenham is an obvious example: a goalkeeper who can make the amazing, unbelievable saves, but is prone to letting in howlers like in the Champions league game later in his career (which decided his fate, with Friedel coming in as a replacement). Being an elite goalkeeper is a mix of the incredible and the mundane; you need to be able to do the basics well and also make the cracking saves your team don’t expect you to make! Ultimately, you want to do your best to avoid making mistakes that could cost your team and gift the opposition a win. Working on technique and getting strong mentally, playing confidently even if such a goal is scored, is definitely important to being consistent throughout a match and the total season. Not over thinking and being able to bounce back from such a goal will ensure that you provide good goalkeeping for your team. Looking ‘outside the box’, I think something can be learnt about goalkeeping from the soccer ‘sweeper keeper’ myth. The mythological concept of the ‘sweeper keeper’ comes from football (or soccer to those outside the influence of the British Isles!) where playing a more attacking and fluid passing style means the goalkeeper has to be more active in their defensive role. As last line of defence, they become more essential to ‘sweeping up’ (I don’t think that’s what it’s meant to mean, but I feel it’s appropriate to the explanation!) back passes and start outlet passes via strong distribution to set up attacks on the opposition’s goal. Whilst it may not be the idealised version of a goalkeeper you would expect in (field) hockey, I believe something can be gleaned from the methodology and applied to the way we ‘keep’ our goals. Stuart Hendy comes out to intercept a pass. The myth and theory originally comes from the pioneering playing style of Gyula Grosics. The Hungarian goalkeeper playing in the 1950s is credited with the revolutionary approach. With a high defensive line, the goalkeeper is often left with a large gap between them and the defensive line. The goalkeeper essentially acts as an extra defender, coming off the line and sometimes out of their area to quash attacks and also calmly distribute the ball to their defence. The ‘sweeper keeper’ has all the desired attributes of a modern goalkeeper; agile, quick, and comfortable on and off the ball. Victor Valdes of Barcelona is seen as the atypical modern version, comfortable with the ball at his left or right foot and able to make pinpoint passes, is said to look so comfortable with the ball at his feet to be able to play in midfield! Hugo Lloris (who has recently joined Tottenham) is said to be the missing piece of a puzzle AVB is putting together, centred around fluid, passing and attacking play. How can it apply to hockey? When it comes to looking to apply this style to hockey, thinking outside of the box to reflect on can be a good way of new ways of developing the goalkeeping approach. The new penalty shuttles have shown how pro-active and aggressive the modern goalkeeper needs to be. The more a team pushes forward and plays an active, aggressive press deep into the opposition’s half, the higher the defence plays and therefore the more open to attack the goalkeeper becomes. By stepping off their line and treating the D as theirs to control and defend, the goalkeeper is more able to shut down scoring chances. With the change in free hits to allow aerials, the goalkeeper needs to be prepared for more aerial threats into the D at the higher level, which become more dangerous when the defence is playing a high press. Acting like a fifth defender is not as uncommon in indoor hockey, with a mobile and aggressive style befitting the fast paced game. Peter McNally in the 80s of Australia acted like an extra player, able to trap with the glove and then play the ball with his stick, along with Scott Kovacs and now Andrew Charter, demonstrate the aptitude of aggressive goalkeeping to shut down scoring chances by working in unison with their defence. However, in terms of the outdoor game, there is little to comment on, but there are some who show a more attacking style in the way their defend their goal. 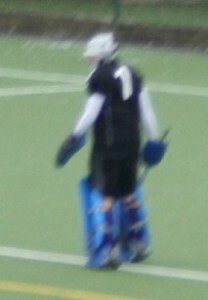 The French style of goalkeeping in hockey often follows the indoor style, with a pro-active and aggressive style which sees the D as the goalkeeper’s role to protect. Julien Thamin was famous for his pro-active approach with the French international team and St Germain HC. I have noticed examples in the England Hockey League of pro-active goalkeeping, with Andrew Isaacs at Havant comfortable coming out his goal to punt away aerials thrown into his D, whilst Stuart Hendy regularly comes off his line to intercept passes in the D.
Whilst hockey goalies aren’t expected to hoof the ball up the pitch to set up a goal (although I’ve seen it done at the national league level!) we can learn a lot from football in the need to be comfortable with the ball. In essence, as goalkeepers we should be comfortable with our kicking enough to act as a passing option. A couple of times I have had to bail out my defence and acting like an extra defender, was able to pass the ball back to them or rush out to kick away a pass into the D and save their blushes. 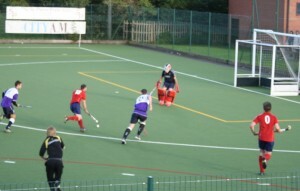 Like a football goalkeeper with strong kicking ability, the field hockey goalkeeper should also have strong kicking skills; able to kick with both feet strongly to distance with strong technique. The ability to come out off the line to intercept or kick away a pass into the D with distance to the sidelines, is an important part of goalkeeping. When faced with a lack of defensive support and having your team push up to push for a goal, you need to be ready to come out and challenge the play. By acting like an extra defender and coming off your line, you offer your team mates the chance to slow down the play; challenging the ball carrier, which in turn gives your team mates extra time necessary to get back into position and provide support to defend the goal. Similarly, whenever a ball gets through, you should be prepared to come out and clear it, like you will soccer goalies do. Just like Casillas rushing out of his box to knock away a high ball with his head, or sliding out with the feet to block (we would have to use the stick! 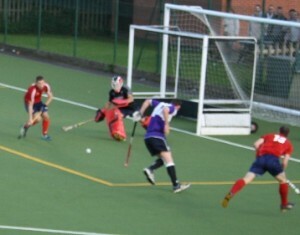 ), hockey goalkeepers can sometimes be seen shutting down scoring opportunities by sliding out with the stick to prevent a one on one. This is an elite skill and needs confidence and practise, but if executed well will shut down a potential goal. Hendy comes out to challenge. ‘Sweeper keeping’ like an extra defender revolves around aggressive positioning: able to read the play well, the goalkeeper can respond to what occurs in front of them from active positioning at the top of the D. Closer to the edge of the D, you will be quicker out to aerials or long passes into the D, ready to challenge a breakaway player or unchallenged players coming into the D. By being prepared to come off your line actively, you stand a better chance of shutting down scoring chances and preventing goals through pro-active goalkeeping involved in the play. On their goal line, the goalkeeper gives away too much space to go through on goal. Off their line, the goalkeeper is more able to challenge a pass or player. The American phrase often used in field hockey refers to the need to dominate your area. It complements the theory of sweeper keeping, with the recognition that is more than just your goal, but your D, that you are guarding. The idea that you need to protect more than just your two posts is essential to strong goalkeeping and a more broadened role of supporting your back line. By ‘protecting your house’ in an active way, it helps reassure your team with a commanding, dominant presence, knowing that you are ready to come out and shutdown scoring chances yourself. Playing like a ‘sweeper keeper’ will obviously as listed previously, involve acting like an extra defender; prepared to come out and play the ball away or shut down attacks. The more active you are in the D, the more agile and physically fit you will need to be. As soon as you go out and down to block or intercept, you need to be up on your feet as soon as possible, before getting back into position to stop further shots at goal. Strong decision making and confidence in your ability will obviously be important as you don’t want to be giving unnecessary goals or getting stranded and out of position. Being alert to rebounds; actively coming out to kick clear a deadened rebound etc. Ultimately, considering the role of the ‘sweeper keeper’ should cause you to rethink the goalkeeping position. Whilst the buzz phrase of ‘sweeper keeping’ is a good way of attributing the skills of a commanding goalkeeper, it is a good way of reflecting on your activity within the D. In essence, the theory acknowledges the need for goalkeepers to be more than shot stoppers. A key part of goalkeeping is to deny scoring chances through interceptions and the like, rather than allow shots to come in. By recognising this you can develop into a stronger and more commanding goalkeeper that your defence has trust in. Author Dan PilgrimPosted on September 25, 2012 September 25, 2012 Categories Developing Your Game4 Comments on Learning from the ‘sweeper keeper’ myth? Having played on teams where I got regularly shelled with shots, I often wondered whether being able to save the vast majority of them meant I was a better goalkeeper than those opposing ’keepers who had less work to do. However, as I moved up the leagues and changed teams, my opinion changed as I realised the importance of being able to make key saves at important times. Making that all important save can be a game changer, influencing the outcome of the game if the current score is close or the game is tied. By being able to make crucial saves when it counts, you are going to give your team a better chance of winning the game. The strength of your defence and the way you organise it (as I wrote about recently) will have a big influence over the number of shots and scoring chances you will face in a game. Whilst you don’t always want to be facing a lot of shots, it can actually have a positive knock-on effect depending on how you play the ‘mental game’. I personally found myself to be a ‘rhythm’ goalkeeper (a term used for ice hockey goalies which refers to playing in a rhythm) as I would find it easier to concentrate better and play better when facing a lot of shots. If you consistently face a lot of shots, don’t take it personally and think of it more as a training session so you don’t get disheartened. I found it a quick way to learn the position being thrown in the deep end! If you have strong technique and are a good shot stopper, then you are obviously going to be able to stop shots that are otherwise going to beat you. Whilst having more shots to stop looks better on paper, since your shots saved versus shots will obviously be a good representation of your ability, it is important to remember that the quality of shots is a better way of seeing how good you are. If the shots are easy (i.e. ‘soft’ goals if you fail to make the save), then a lot of easy saves aren’t going to test your core foot work and save technique, for example. When playing competitively at good levels of hockey, you will notice that when playing behind a strong defence you will obviously face less scoring opportunities, which in essence makes your life harder! Any scoring chance therefore becomes more important because when the opposition does break through they are more likely to produce a shot that really tests you because they cannot waste opportunities. This in turn means that you are going to have to be prepared to stop it! With less shots coming your way, you also have to be much more alert because losing your attention and ‘dropping off’ will mean you make yourself beatable. In contrast, facing few but hard to save shots is going to test your ability. Every shot is essentially an opportunity to prove yourself and focusing on a closed mindset of ‘one save at a time’ will help you direct your efforts and continue playing to a high level. Playing like it’s ‘0-0’ will also direct your attention away from worrying about the score line and help you focus on stopping those shots. Ultimately, however many shots you face, you need to be able to stop shots no matter the quality. It could be argued that no matter the number of shots you face, when it comes down to the crunch, you need to save them! I think it’s harder to be a goalkeeper on a strong defensive team because if you only face one goal and you fail to stop it, you are going to under more scrutiny. Whilst it’s not really that fun to face a ridiculous amount of shots (as it can be disheartening over a long period of time), as you improve and get the chance to play on better teams, you’ll recognise the need to perform at key times in the match when it matters the most. Author Dan PilgrimPosted on August 20, 2012 Categories Developing Your GameLeave a comment on Quantity versus quality?